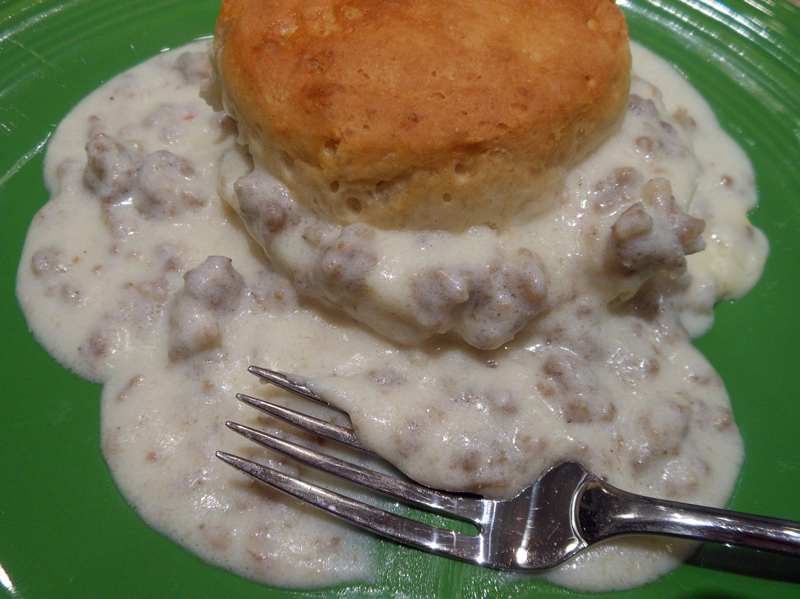 You can serve sausage gravy many ways, but I love them over biscuits. You can make your own biscuits, but the quickest way is to buy you a can of refrigerated buttermilk biscuits. Or, if you have no biscuits and don’t want to make them, serve this over toast. You can have breakfast, lunch or dinner on the table in no time. My son-in-law loves sausage gravy and biscuits and doesn’t get it very often, so I had the family over and made this for dinner one night. I had to double the recipe. Yum! Prepare biscuits as per directions on can. Keep warm. Brown sausage in a skillet, stirring until sausage crumbles. There was not much drippings from my sausage, so I didn’t need to drain any grease off. But if yours is, keep only 1 tablespoon drippings in skillet and drain the rest off. Add butter to drippings and sausage; cook over low heat until butter melts. Add flour; stir until smooth. Cook 1 minute, stirring constantly. Gradually add milk; cook, stirring constantly, over medium heat 10 minutes or until thickened and bubbly. Stir in salt and pepper. Split biscuits open; serve with gravy. This is one of Bill’s favorites!!! I will definitely make them! !